At this point of the game White has to admit that the left side groups are dead; and think in terms of how to use them yet to some advantage. threatens to cut off a large group of Black's. prevents the cut but it was a mistake, as accurate reading shows. Black could play at . Black should not be afraid of a cut. threatens to connect on the first line: if White connects with then and put White into shortage of liberties: a group is in atari, but connection at a does not increase the number of liberties, so Black does not have to fight a ko to connect. in the game, encouraged by a submission of the opponent, pushes further.
. Black continues to play submissively, but if Black plays at now he will have to fight a ko to save his stones.
. Captures three stones. The value of this move is a little bit more than 3 points. But White is also a little scared about the status of the group at the bottom etc. So White clarifies the situation at the bottom and in the center. It is important to note that players of IGS 5k level in a fast game (10 minutes for 25 moves) cannot as a rule count the score. They have an impression only. In this case White feels that the game is close at the moment: if she is behind then it's only just and there is hope for a win.
. This is a very large point. Is it the largest? That needs calculation.
. A mistake. White does not agree that the previous black move was the largest. She thinks that saving two white stones and capturing two black stones is a bigger move. But at least White had to use the psychology of the opponent. 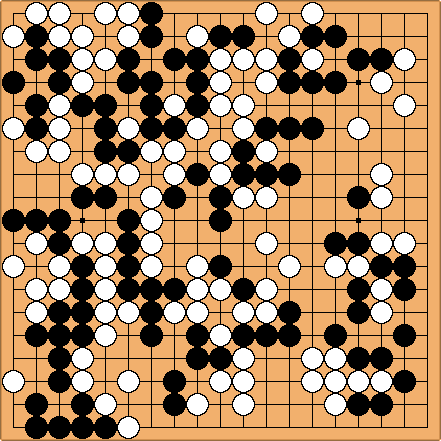 If Black considers playing in this area the largest move on the board then he would answer , in gote. White will be able to save her two stones while the situation at the top would be settled.
. Natural continuation. Black considers this region the most important.
. White insists that there is still more in the center. She is wrong, though a later mistake by Black helped her. If playing here, White would do better with a.
. Black continues to insist. Actually, this is most often a correct approach to yose. Don't reply, don't give your opponent the luxury of sente moves.